From the "Old Habbo" era to the Great Merge of 2010, to the ban of gambling, all the way to the Mute of 2012, throughout the ages we saw how the game changed and how it grew. 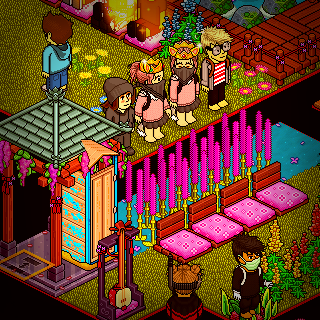 We are the Habbo Veterans, who through hard times have endured and prevailed. Leave your sticky notes in this room with your feedback and comments and to earn the "Sticky Scribbler" achievement. Come and play a game or two of the bobba classic, Pac-Man! Get your name on the leaderboard and win some prizes! ded at you and ur life. Taken in this room on 9 July 2018 and received 3 likes. Taken in this room on 9 July 2018 and received 1 likes. Taken in this room on 17 June 2018 and received 0 likes. Taken in this room on 10 June 2018 and received 0 likes.